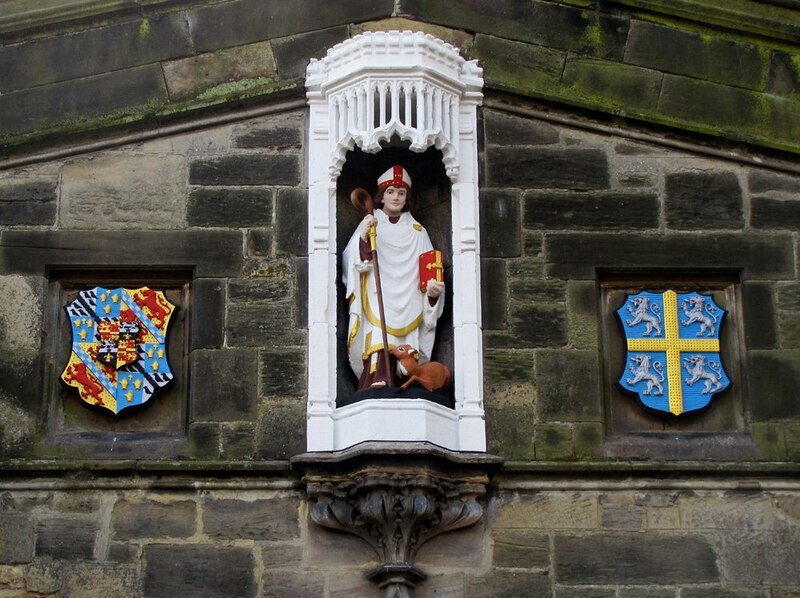 Statue of St Giles with coats of arms of the Marquess of Londonderry & the See of Durham. Although we know relatively little about St Giles, we believe that Giles lived in the late 7th – early 8th century enacting most of his ministry in Provence, France. According to sources, Giles was originally from Athens but fled to France and became a hermit, living in a forest near the mouth of the Rhône. According to one account, while out hunting, Wamba, King of the Visigoths, chased a hind into the hermitage where Giles lived. Wamba is said to have shot an arrow which wounded and crippled Giles, with whom the hind had taken refuge. This is why Giles is commonly depicted in icons (and indeed above the main entrance of St Giles’ Church) with a deer. Another legend tells that Wamba was so impressed with Giles’ holiness that he founded an abbey for him. The town that grew around this abbey, St Gilles, became an important pilgrimage place, particularly in the Middle Ages as the abbey became a safe refuge for those travelling on the Camino de Santiago (the Way of St James to Santiago de Compostela). A 12th Century church Saint-Gilles-du-Gard now stands where Giles’ monastery was said to have been built. St Giles was one of the most popular medieval saints and is included in Catholicism among the ‘Fourteen Holy Helpers’. In England, 160 churches were dedicated to St Giles, of which St Giles’ Durham is one of the oldest. St Giles is the patron saint for cripples, lepers, beggars and blacksmiths and his feast day is celebrated on the first of September.